This post contains free Christmas cut files and affiliate links. By purchasing through the affiliate links I do receive a small commission. 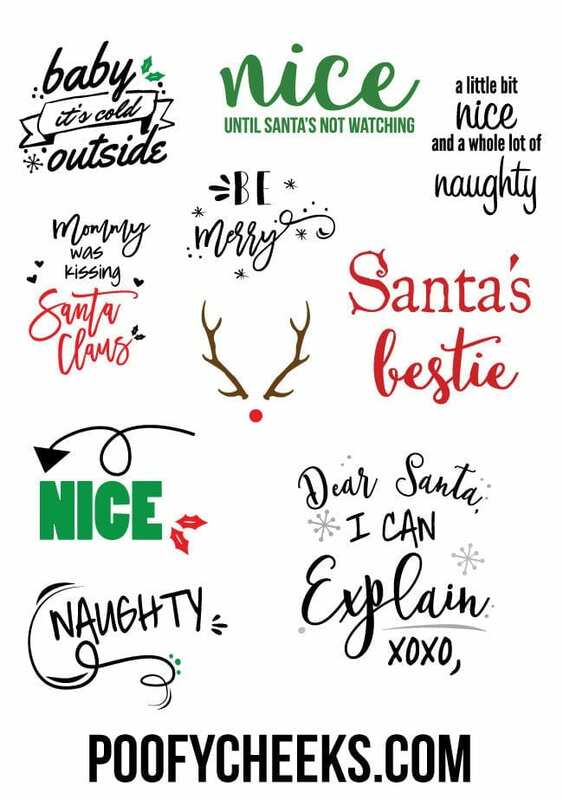 Who is excited for Christmas Cut files for your Cricut and Silhouette machines? I think I have been waiting to write this post since I shared my first set of free cut files back in February! Who doesn’t love Christmas? There are so many things to make from gifts to shirts and oh so much more. This is only the first set of a few Christmas cut files I have up my sleeve so be very excited. 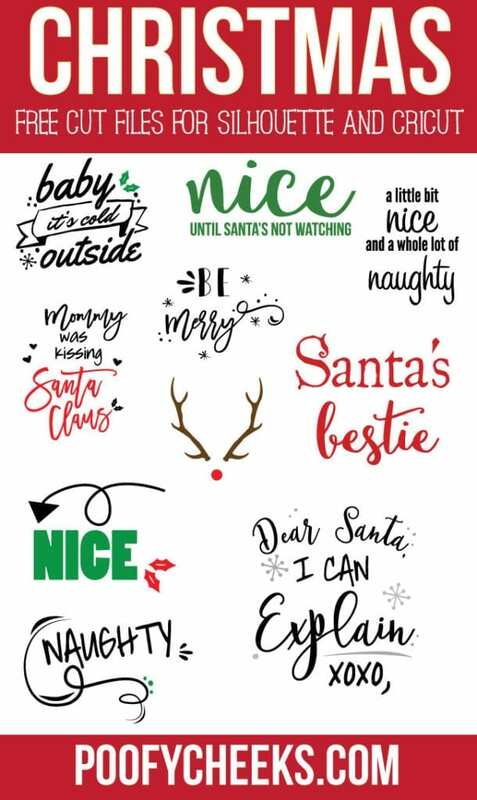 A few days ago I shared over 18 Christmas blanks that are prefect for adhesive or heat transfer vinyls. I know some of these cut files would look perfect on those blanks. When I created these cut files I was thinking they would be great cut onto heat transfer vinyl for shirts. Although they would be great for any crafty idea you have! 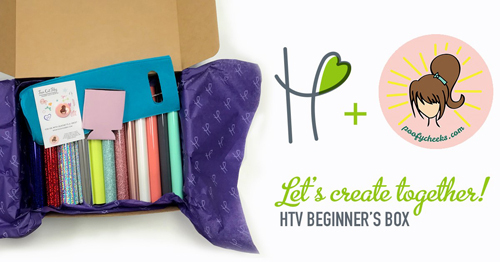 If you are new to cutting or haven’t worked with heat transfer vinyl that often I have teamed up with Happy Crafters to offer a beginner HTV bundle. The goal was to give you all different types of heat transfer vinyls at one low cost. We met our goal because not only does the bundle have different types of vinyls, it also has two vinyl blanks and cut files from Poofy Cheeks and Happy Crafters. You can cut these files onto any medium you prefer and make SO MANY THINGS! Make mugs, cups, shirts, onesies, tote bags or basically whatever your heart desires. I recently shared where to buy blanks and Christmas Vinyl Blanks if you need some ideas. Sign up and get instant access to the Christmas Cut Files. Join over 2,500 others who get access to our free cut file library. I love these and would love to use them. I have them downloaded, see the SVG files, but I’m not sure how to separate them into individual files instead of having all of them together. You need to select the cut files then in Cricut Design Space ungroup them. Copy and Paste the one(s) you want to use. I just got a Cricut for Christmas so I’ll be doing a tutorial on this very soon!! I love your blog! I am unable to open the SVG also. Hi Brett – are you able to download the file and see the SVG or is it not even showing up at all for you? Thanks for the help! It is not showing up at all. I am having a problem finding this in SVG. When I go to download it is only coming up as a jpeg and dfx. I am new to this so I am probably doing something wrong. Thanks.